THE TOP 25 CIGARS OF 2014 were revealed by both CIGAR AFICIONADO Magazine and CIGAR JOURNAL Magazine. Cigar Aficionado Magazine is very well known in the North American Market and is considered the best Lifestyle Magazine especially for Cigar Lovers. On the other hand Cigar Journal (previously known as European Cigar Journal) is very well known in the European market and is expanding its name into the North American Market for the last few years. So both the Magazines have revealed the Top 25 Cigars of 2014. Of Interest, is both the Lists have a number of same/similar Cigars which appear in both the lists just in different rank order. Either way, Nottingham Cigars & Pipes, Premiere Tobacconist of Edmonton, has you covered! 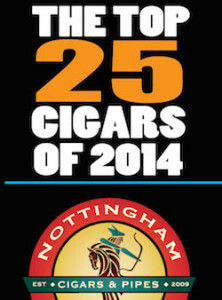 We are now set up to showcase to our esteemed customers The Top 25 Cigars Of The World. So come on down to buy and then smoke to finally decide yourself which Cigar and from which list is your absolute favorite. The list has Habanos or Cubans, and non cuban cigars from Dominican Republic, Honduras, Nicaragua, Mexico and Costa Rica. As a matter of fact we also have a number of Best Buy/Best Bargain Cigars of Year 2014 as determined by Cigar Aficionado Magazine. * Please note, that not all the Top 25 Cigars are available in Canada due to trademark/copyright laws. However we have tried our best to make the list as exhaustive as possible. So Start the New Year 2015 with some of the Top Notch Cigars from around the globe. Source: This list of top 25 cigars was published by Cigar Aficionado Magazine. Source: This list of top 25 cigars was published by Cigar Journal Magazine.